Cathryn Falwell has written and illustrated many award-winning books for children, among them David’s Drawings, a Bank Street Best Children’s Book of the Year, and Butterflies for Kiri, a “Choices” selection from the Cooperative Children’s Book Center. 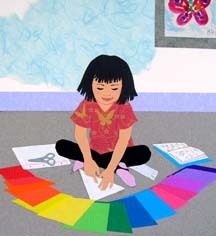 Her newest picture book, Rainbow Stew, was released from Lee & Low Books this spring. I love watching kids engaged in the process of creativity. Drag out the art supplies, and most children will happily get involved on some level. For a few, though, making art is their passion. I was one of those kids, so I have a special place in my heart for them. Two of my children’s picture books for Lee & Low celebrate creative children and the importance of art in a child’s world. Our family moved many times when I was a child. Drawing was a way I connected with other children. In David’s Drawings, I made a story about a young child who makes a picture of a beautiful bare tree he saw on the way to school. His classmates notice his drawing, and are eager to contribute to the creation. Together they make a beautiful collaboration, and David makes new friends. In the story, David invites the other children to add to his drawing, and they in turn offer their imaginative ideas. Encouraging this kind of creative collaboration invites new ways of communication and sharing. Many teachers have sent me photos of similar projects their students have made as a follow-up to reading David’s Drawings. 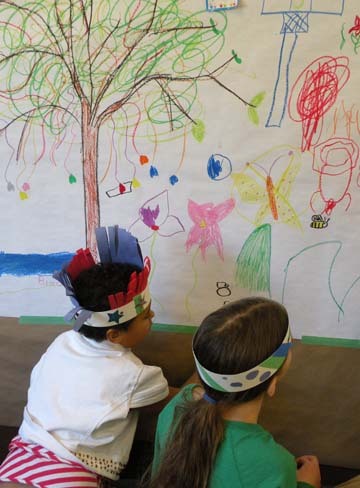 Like the picture in the story, some groups start with a bare tree which is embellished by the participants. Others have used different themes that may reflect another subject area. Wise teachers encourage all to participate, honor all contributions, and invite conversation about the creative process. My Aunt Sandy worked as a commercial artist. For my seventh birthday she gave me a box of amazing art materials. There were scraps of exotic papers: prints, foils, fuzzy textures….papers now stocked by neighborhood scrapbook stores, but, back then, completely new for a kid who was only familiar with school construction paper. I would gently take them out of the box, marvel at their beauty, and then put them carefully away–too afraid that if I used them they’d be ruined. The memory of that fear inspired my picture book, Butterflies for Kiri. A young girl receives a box of origami papers from her aunt for her birthday, and marvels at their delicate beauty. Distraught after her first failed attempt at origami, she sets the beautiful papers aside. Creativity isn’t all play. It involves problem solving, practice and patience. Kiri goes through this process in the story, finally able to be successful with origami, but also finds another creative way to use the beautiful paper. In our test-filled schools, there is often just one correct answer to a given problem. When children engage in creative art, they are intuitively making choices and discoveries, and finding many different answers. Kiri solves a problem with her perseverance, but also by thinking in new directions–an important skill to encourage in all children. 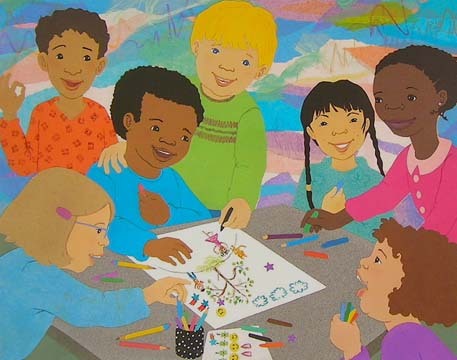 Picture books offer wonderful opportunities for children to learn about other people in the world. Some young readers might identify with David or Kiri; others will discover children whose interests and ideas are different from their own. Still others may be inspired to explore their own creativity in new ways. In our world of ever-developing technology, I hope we continue to haul out the art supplies and let all children be creative. I have many of Cathyrn’s books and love reading them to children. She usually puts more information in the back of the book. She often explains how she uses different things to put in her pictures. She is a very talented artist. Cathryn is my wonderful daughter. Need I say more?